A university has recently released a report detailing interesting statistics on the rates of divorces across the US, as well as statistics describing the demographic groups getting divorced most often. The study revealed some unexpected findings regarding divorce rates in the US. Since 1970, Bowling Green State University’s National Center for Family & Marriage Research has been releasing annual reports describing the national rate of divorce, as well as divorce rates at the state and local level. According to their most recent report, divorce rates have fallen for a third consecutive year, while marriage rates climbed. The report notes that the divorce rate in 2015 was 16.9 divorces per 1,000 married women over age 15. 2014’s divorce rate was 17.6 per 1,000 married women. According to additional data released by the group, marriage rates increased last year, with 32.3 marriages per every 1,000 unmarried women over age 15. This is an increase from the 2014 rate of 31.9 marriages per 1,000 unmarried women in 2014. While some may have assumed that divorce rates are on a steady increase year to year, 2015’s divorce rate is in keeping with a long-running trend of a decreasing divorce rate across the US. The highest annual divorce rate was recorded in 1980 at 23 divorces per 1,000 married women, which means that there has been a 25% decline overall in the divorce rate between 1980 and 2015. The study showed that Washington, DC had the highest divorce rate in the country at 30 per 1,000 marriages, and Hawaii had the lowest, at 11 per 1,000 marriages. New Jersey had the fifth-lowest divorce rate, at 12.9 divorces per 1,000 married women. 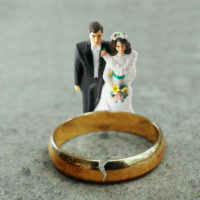 Overall, divorce rates are down among younger people but increasing among older adults in what some experts call the “gray divorce revolution.” While the reasons for this pattern are not entirely clear, some researchers speculate that since Millennials are waiting longer to tie the knot, their divorce rates are low because so few of them are married. Others suggest that due to changing social norms, older couples are getting the divorce they may have long wanted but put off due to social stigma. If you are considering divorce in New Jersey, speak with an experienced and dedicated family law attorney about your options by contacting Union divorce lawyer John B. D’Alessandro for a consultation, at 908-964-0102.